The more miles we log on our bikes, the more corners of this country we get to stop and explore, the more we want to tell everyone we know about the joy of traveling by bicycle. We’re thrilled whenever we hear about anyone heading off to travel or explore in any manner, but bicycling happens to be near and dear to our hearts. On a bicycle, the world slows down around you and, as you become more aware of your surroundings, you experience everything on a deeper level. If you haven’t tried it yet, even for just a day, you really should. We promise it’s a high like nothing else! The more we travel and get excited about getting other folks out on their own bicycles, the more we want to support and help create a world which is friendly and encouraging and supportive to bicycle travelers. And the more communities that we roll through and find folks who are working to create a bicycle-friendly environment, the more we know it’s possible to see a world of bicycle travelers. So, we thought we’d share some ideas about creating a world that’s friendly to bicyclists and bicycle travelers. If you feel inspired to join us in making this happen, we’ll also share some ways you can do so. We’re pinpointing the Texas State Park system for a couple reasons… (a) because we’ve spent the past three months exploring many of their parks (and think they’re some of the best we’ve seen so far), (b) because we have a lot of readers from Texas, (c) because we know that the Texas State Parks folks are paying attention to their constituents (and are eager to create a great system that’s well-used), and (d) because, for a very large state bureaucracy, they’re really pretty innovative and well-managed. Way back in March, when we were first rolling in to Austin, we had planned to camp at McKinney Falls State Park. We were turned away because the park was full, and we were told to go to another facility as far away as 20 miles. We were stunned. In all of our travels and time on the road, we have never been turned away from a full state park. Even in Southern California, where you get all sorts of funny looks when you roll up on bike. In Washington, we discovered, it’s actually state park policy to make space for folks who arrive on foot or on bike, because they recognize that there’s a limit to the distance you can travel in this manner. Originally we fumed about the McKinney incident. Then, we calmed down and all but forgot about it, tailoring our trip as needed so that we wouldn’t arrive at a state park on a weekend (which is when they’re full during the spring). And then a funny thing happened at Caddo Lake. A small Facebook status update caught the attention of someone at the State Parks HQ office in Austin. And we realized how much they’re paying attention and eager to please their visitors. So, yesterday, we put a letter in the mail to the folks at the Texas State Parks HQ, challenging them to be more welcoming of bicycle travelers. If you’d like to read the text of the letter, head over to our Facebook Fan Page and read this note. We’ll keep everyone updated about what happens. If you’re interested in helping Texas State Parks create a policy that’s more inviting of bicycle travelers, consider sending them your own letter or email. You can also find them on Facebook, but it appears as if each individual park has its own separate fan page. You can blog about it and tell your friends. And if you hear back, please let us know! We love Adventure Cycling Association. A great group of folks (who we hope to meet in person one day) are actively working to make the US a great place to ride a bike! If you’re not familiar with them, head over to their website. 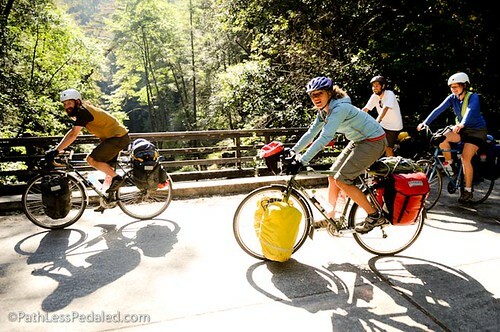 We hope you’ll join us in creating a bicycle-travel-friendly world. 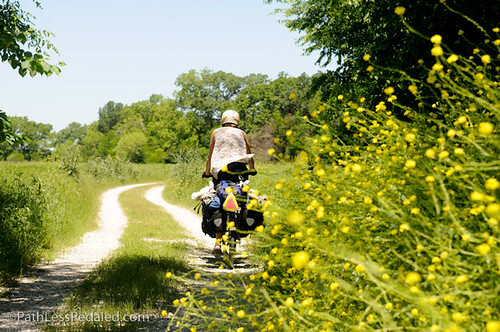 Speak up about exploring the world on bike and what it means to you. 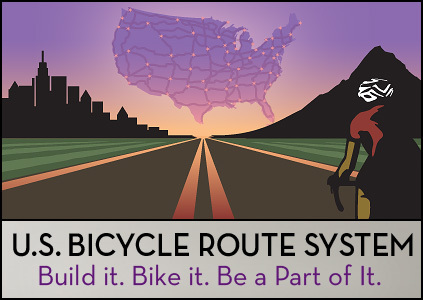 Show your support for systems nation-wide that enable more people to travel by bicycle. And if the above-listed advocacy opportunities don’t speak to you, just get out on your bike and ride around your area and share your love of experiencing life on two wheels. We donated to the USBRS today precisely because your adventures on pathlesspedaled.com have enlightened us to the joys of long distance cycling. You rock! Cheers! Thanks guys. Hope PDX is treating ya’ll well! Thanks for the great post Russ and for your support! Learned about this from your FB post and donated right away. Thanks for the info! Ride on! I’ve been following your ventures and have throughly enjoyed the images and stories but I’m really torn about this letter. I’m anti special treatment for cyclists. I’m not special because I ride a bike and I don’t expect special treatment. Example, I don’t support bike lanes or want be passed on the right within 3′. I ride in the lane just like a car, just like the law allows. I think Texas parks are extremely inviting of all guests no matter the mode of transportation. They have rules and limitations like all organizations. Could they have let two extra people in, most likely yes, but should they be chastised for following their guidelines? I don’t think so. I’m sure I’ll be nailed for this post but as an avid cyclist, I sure don’t want to be thought of as a victim. Thanks for bringing up a good point about the issue of special treatment. We both agree that cyclists should be treated like any other road user and have the same rights and responsibilities. Like you, I don’t want to see a network of special bike paths that cyclists are forced to use. However, I don’t see it as a special treatment of cyclists for Texas State Parks to make space for bike tourists when the parks are full, as there is already overflow camping for RVs. That’s special treatment for RVs. If there’s already a provision allowing other folks to make use of an overflow space, why not open this space to bicyclists as well? Thanks for speaking up – we value all opinions here. I have travelled to many places in my life and really feel that the benefits have been huge, both to me and the many people I have met on the way. My favourite countries have always been and will always be the eastern countries.